Get moving! Feel a little lethargic, feel a little out of shape? Looking to get your behind in gear and get all the right kinds of attention? 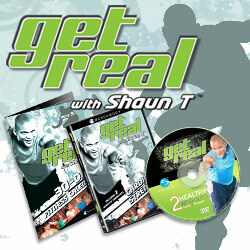 Well, this is exactly what you need--let fitness expert Shaun T get you sweating and dancing, moving and exercising. If he could create the hardest At-Home fitness exercise routine ever with INSANITY, then you just know he'll be able to whip you into shape without even blinking an eye. 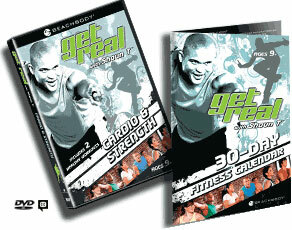 Get Real is is designed for all kids of all shapes and sizes, and comes with two healthy and energizing routines. You don't need any equipment. You don't need to go to a fancy gym. All you need is a DVD player and the determination to start changing TODAY. Whether you have a few pounds to lose or just want to look better for that hottie in homeroom, Shaun's got you covered, and you'll be healthier and stronger in no time! Health snack ideas for when you're on the go! Handy guide to reading nutrition labels. 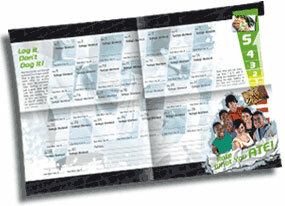 Wall calendar to keep track of your fitness and eating goals.